Here is just one example where the underlying geometry is faulty. See the two areas I circled in red? Lines overlap other lines instead of ending cleanly. When AutoCAD encounters something like this it gets confused. It will try to make sense of it but if it can't then it will lock up. Understand? 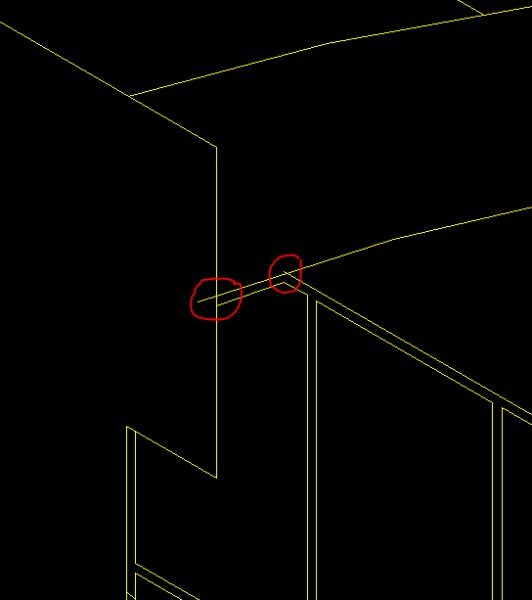 The other problem for you is that you are probably attempting to use the command on a much larger area of the drawing which means AutoCAD is most likely encountering many more of these anomalies. Damn so i need to redraw everything? I would try not to redraw everything if I could possibly avoid it. You might however try finding and correcting the problems and working on smaller areas. Since much of your drawing consists of similar objects maybe do one section then copy it how many ever times you need. Follow me? If the PressPull command works in another drawing but not this one then it is the drawing that is flawed and not a problem with AutoCAD. In my opinion you could use the PressPull command but you'll have to clean up the geometry first. Then you'll have to work with a smaller subsection of the drawing. Unfortunately I am in the middle of helping someone about 3000 miles away with a rather more vexing problem (via Skype) so I will have to leave this conversation within the next couple of minutes. However, since this site is open and visited 24 hours a day you might soon be assisted by another forum member so hang in there. When then you still have plenty of time. I think you can do it but it will take some work. Sorry, but I have to beg off now. I will check back in the morning (Saturday). Leave a message about what progress you have made before signing off yourself. Good luck. Could i make a suggestion..
open autocad and create a new drawing. Determine if the presspull works..
Also from a quick glance at the drawing. As mark suggests. Do some cleaning up on it. If your handy with the trim command. If the lines intersect you can trim them. Esentially creating closed loops. I would advise not using the 'select all' option due to the fact its freezing up. I would take a quess and say the lines dont actually intersect, were the lines drawn on the same XY plane ?? There is a lot of unneeded geometry in it. ckara: You've now basically gotten the same advice from two different people. I suggest you start following it. The problem is not with AutoCAD itself but with your geometry. Looking at the front of the building you have one section that is repeated one additional time (right end of building) and another section that is repeated three additional times. That means you really only have two sections that have to be extruded. You've already reduced your workload by two thirds.